Fast growing trees and tap-rooted species can be prone to girdling and kinking. Although an extensive characterization of tree species has NOT been conducted, Linden, Norway and Sugar Maple, Oak and Pine trees have been observed to develop girdling roots. 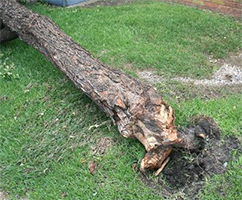 Trees are weakened and can be killed by roots that girdle the trunk and main roots. When a root circles a trunk or another root and they both continue to enlarge, each will be deformed at the point of contact, particularly when young. Each will slow the caliper growth of the other; but the trunk tissue will be more compressed than root tissue. Initially the movement of food from the top to the roots is restricted and root growth is slowed; then the entire plant is weakened and if severe enough, the trunk can break at the girdle. A gradual decline in growth and appearance occurs as the girdling becomes more intense. It is most apparent in autumn, when leaves of deciduous trees colour and fall earlier than is normal. 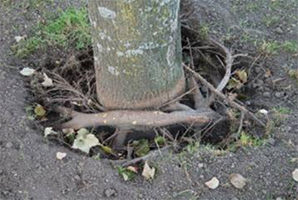 Girdling roots may become a serious structural defect in mature trees. Roots that grow around the trunk in a circular manner; rather than laterally away from it are called circling roots. When they constrict other roots or the trunk, they are termed girdling roots. Circling and girdling roots occur naturally, but are most often associated with transplanted trees. Formation of girdling roots is associated with transplanting and probably resulted from stimulation of existing and new lateral roots when the main roots were cut as the root ball was dug. The lateral root grew at right angles to its primary root; some were close to the trunk. Container grown trees also develop circling and girdling roots. Useful steps to prevent girdling roots include inspection of plants in the nursery and proper planting procedures. 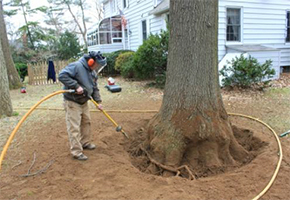 For existing trees, inspection of the root collar is valuable. A normal flare at ground level will usually rule out girdling roots. If a trunk is completely encircled by a girdling root or roots it will be larger in caliper just above the girdle than below. Girdling roots are often visible at the soil surface. If they are not, excavate the soil carefully from around the trunk using an airspade to expose and remove girdling roots where possible.